Apogee and perigee refer to the distance from the Earth to the moon. Apogee is the farthest point from the earth. 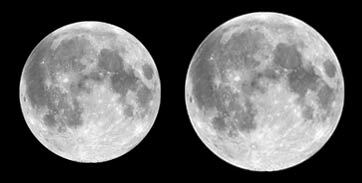 Perigee is the closest point to the earth and it is in this stage that the moon appears larger. Looking at the moon in the sky without anything to compare it to, you wouldn't notice any size difference. But the difference in size can in fact be quite significant. Astronomers have formulas for computing the exact distance at any point in time, but the average distance from Earth is 237,700 miles (382,500 km).